This is me (Melissa) with my 5 1/2 month old son, Nolan. My husband Chris is behind the camera. A weekend outing to Morris Arboretum in Philadelphia, PA. I had very little experience with babywearing and really gave up on it until I met a wonderful group of moms that really enjoyed babywearing and convinced me to give it a try. 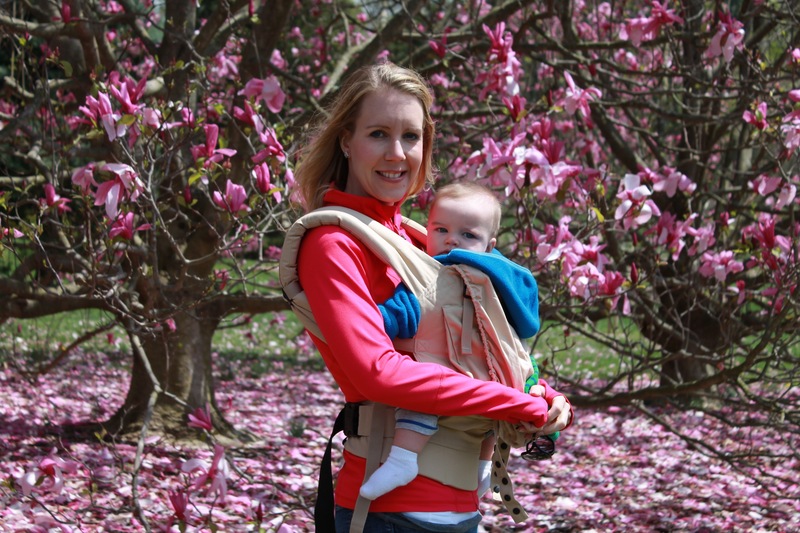 I am wearing the Ergo carrier which I had just bought the day before the picture was taken. This was our first time out using the Ergo and both my husband and I were skeptical that it would work for Nolan. We even brought our stroller with us, just in case. We were shocked to see how content Nolan was and how much he enjoyed being able to look around at our level. I was also amazed how comfortable the Ergo was and that I didn’t experience any pain carrying my 16 lb. baby. We spent several hours walking around and as soon as Nolan started to fuss I put the cover over his head and he fell asleep on my chest. It was the most precious moment and I was glad to have my baby so close. Our outing today has converted me to babywearing and I know that I will continue to wear Nolan whenever I can. By the way, we didn’t even use the stroller once!